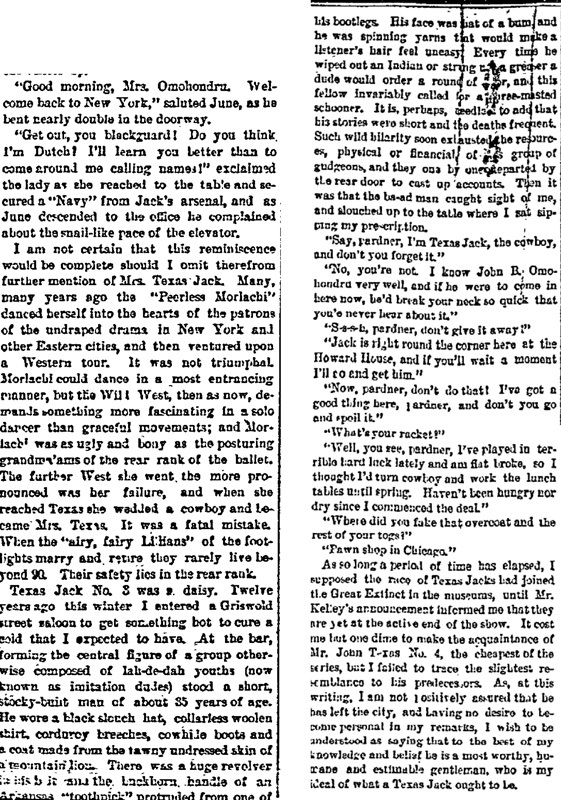 I should have been greatly surprised and pained if, among the aggregation of longhaired, nomadic cow-punchers from Colorado, Chicago and Connecticut, collected and collated by the Only James H. Kelly, and by him placed upon exhibition at the Merrill Hall Museum recently, there had been no Texas Jack. It is now many years since I started along down Life's weary toepath, and by diligent plodding and but brief stops at the wayside refreshment booths and pleasure gardens I have turned the course to the homestretch. Even as there are oases amidst the sandy wastes, so are there green spots along the way of Life's dreary trudge. Not the least of these have been the Texas Jacks I have overtaken at one stage and another all along the route, and the conviction has been forced upon me that they are a numerous family, with a wide-branching genealogical tree. When but a youth I saw the star of Santa Anna wane and the lone star of Texas rise in the Federal firmament. Of the thousands of Northern boys who followed Scott and Taylor and Pierce to the land of the Montezumas many remained there, but it was from the grave necessity of war. All who were alive hastened to recross the Rio Grande, the north bank of which was their Plymouth Rock. I had a desire to see something of the territory we had acquired and it was while gratifying this ambition that I first saw Texas Jack. I did not make his acquaintance and it is not literally true that I saw him. All I saw was a maze of legs that were as indistinguishable as the spokes in a rapidily revolving buggy wheel and a pair of mule-like ears that stretched along the horizon like a two-tailed comet. There was a rushing sound, and, though the cause was invisible, the glimpse of legs and ears and the swirling sand and sagebrush that went hurtling after convinced me that some sort of a fast express was departing and that I should be too late to take it unless I hurried up. I could not see the object, but the dust and splinters and atmospheric disturbance showed me where the trouble was, and I fired. It was only a snap shot, it is true, but such shots are as good as any when one shoots along a perfectly horizontal line extended to infinity. The smoke, and sand, and other debris settled quickly, and mentally ejaculating "Dead bird!" I started down the simcon's track to retrieve. I have no doubt, whatever, but that bullet ran an up-and-up race and did its best to win for me, but ten minutes walk brought me to where it lay, face down in the sand, clean pumped out and gasping for breath. 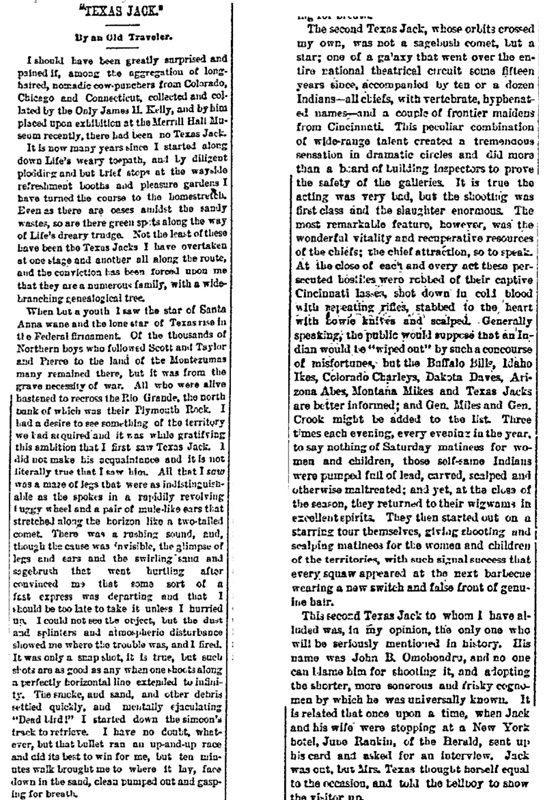 The second Texas Jack, whose orbits crossed my own, was not a sagebrush comet, but a star; one of a galaxy that went over the entire national theatrical circuit some fifteen years since, accompanied by ten or a dozen Indians—all chiefs, with vertebrate, hyphenated names—and a couple of frontier maidens from Cincinnati. This peculiar combination of wide-range talent created a tremendous sensation in dramatic circles and did more than a beard of building inspectors to prove the safety of the galleries. It is true the acting was very bad, but the shooting was first class and the slaughter enormous. The most remarkable feature, however, was the wonderful vitality and recuperative resources of the chiefs; the chief attraction, so to speak. At the close of each and every act these persecuted hostiles were robbed of their captive Cincinnati lasses, shot down in cold blood with repeating rifles, stabbed to the heart with bowie knives and scalped. Generally speaking, the public would suppose that an Indian would be "wiped out" by such concourse of misfortunes, but the Buffalo Bills, Idaho Ikes, Colorado Charleys, Dakota Daves, Arizona Abes, Montana Mikes and Texas Jacks are better informed; and Gen. Miles and Gen. Crook might be added to the list. Three times each evening, every evening in the year, to say nothing of Saturday matinees for women and children, those self-same Indians were pumped full of lead, carved, scalped and otherwise maltreated; and yet, at the close of the season, they returned to their wigwams in excellent spirits. They then started out on a starring tour themselves, giving shooting and scalping matinees for the women and children of the territories, with such signal success that every squaw appeared at the next barbecue wearing a new switch and false front of genuine hair. This second Texas Jack to whom I have alluded was, in my opinion, the only one who will be seriously mentioned in history. His name was John B. Omohondru, and no one can can blame him for shooting it, and adopting the shorter, more sonorous and risky cognomen by which he was universally known. It is related that once upon a time, when Jack and his wife were stopping at a New York hotel, June Rankin, of the Herald, sent up his card and asked for an interview. 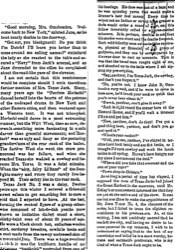 Jack was out, but Mrs. Texas thought herself equal to the occasion, and told the bellboy to show the visitor up. "Good morning, Mrs. Omohondru. Welcome back to New York," saluted June, as he bent nearly double in the doorway. "Get out, you blackguard! Do you think I'm Dutch! I'll learn you better than to come around me calling names!" exclaimed the lady as she reached to the table and secured a "Navy" from Jack's arsenal, and as June descended to the office he complained about the snail-like pace of the elevator. I am not certain that this reminiscence would be complete should I omit therefrom further mention of Mrs. Texas Jack. Many, many years ago the "Peerless Morlachi" danced herself into the hearts of the patrons of the undraped drama in New York and other Eastern cities, and then ventured upon a Western tour. It was not triumphant. Morlachi could dance in a most entrancing manner, but the Wild West, then as now, demands something more fascinating in a solo dancer than graceful movements; and Morlachi was as ugly and bony as the posturing grandma'ams of the rear rank of the ballet. The further West she went the more pronounced was her failure, and when she reached Texas she wedded a cowboy and became Mrs. Texas. It was a fatal mistake. When the "airy, fairy Lillians" of the footlights marry and retire they rarely live beyond 90. Their safety lies in the rear rank. Texas Jack No. 3 was a daisy. Twelve years ago this winter I entered a Griswold street saloon to get something hot to cure a cold that I expected to have. At the bar, forming the central figure of a group otherwise composed of lah-de-dah youths (now known as imitation dudes) stood a short stocky-built man of about 35 years of age. He wore a black slouch hat, collarless woolen shirt, corduroy breeches, cowhide boots and a coat made from the tawny undressed skin of a mountain lion. There was a huge revolver [unreadable] and the buckhorn handle of an Arkansas "toothpick" protruded from one of his bootlegs. His face was that of a bum, and he was spinning yarns that would make a listener's hair feel uneasy. Every time he wiped out an Indian or strung [unreadable] greaser a dude would order a round of [unreadable], and this fellow invariably called for a three-masted schooner. It is, perhaps, needless to add that his stories were short and the deaths frequent. Such wild hilarity soon exhausted the resources, physical or financial, of this group of gudgeons, and they one by one departed by the rear door to cast up accounts. Then it was that the bs-ad man caught sight of me, and slouched up to the table where I sat sipping my prescription. "Say, pardner, I'm Texas Jack, the cowboy, and don't you forget it." "No, you're not. I know John R. Omohondru very well, and if he were to come in here now, he'd break your neck so quick that you'd never hear about it." "S-s-s-h, pardner, don't give it away!" "Jack is right round the corner here at the Howard House, and if you'll wait a moment I'll go and get him." "Now, pardner, don't do that! I've got a good thing here, pardner, and don't you go and spoil it." "Well, you see, pardner, I've played in terrible hard luck lately and am flat broke, so I thought I'd turn cowboy and work the lunch tables until spring. Haven't been hungry nor dry since I commenced the deal." "Where did you fake that overcoat and the rest of your togs!" As so long a period of time has elapsed, I supposed the race of Texas Jacks had joined the Great Extinct in the museums, until Mr. Kelley's announcement informed me that they are yet at the active end of the show. It cost me but one dime to make the acquaintance of Mr. John Texas No. 4, the cheapest of the series, but I failed to trace the slightest resemblance to his predecessors. 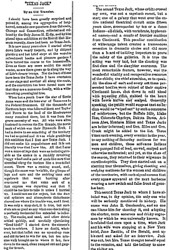 As, at this writing, I am not positively assured that he has left the city, and having no desire to become personal in my remarks, I wish to be understood as saying that to the best of my knowledge and belief he is a most worthy, humane and estimable gentleman, who is my ideal of what a Texas Jack ought to be.